This video has been making the rounds for a few days and we’ve yet to feature here. This isn’t a commercial, but rather a short promo video highlighting webOS. Given the similarities in form factor to the original Pre, it will be interesting to see how Palm/Verizon market the Palm Pre 2. Will they go purely OS and how do they convey all of the improvements in the Palm Pre 2? What we do know is that it’s not likely that we’ll see Creepy Girl 2.0. Did you see those great ads pushed out the other day from Palm? It looks like Microsoft, who forgot to borrow copy & paste or multi-tasking, has the same ad team or at least the same great idea. 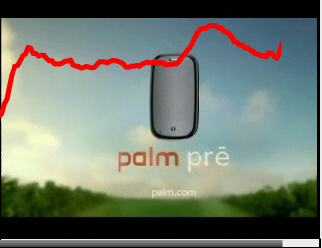 Now it’s time for Palm to creatively borrow a few elements from the Microsoft ad. How about adding a few different demographics and have the people in the ads carrying webOS phones. Are we off in our assessment or do these commercials look terribly similar? A nationwide study of 305 viewers looked at response to the new Palm Pre ads. While comments at our site and others seem to have an overwhelmingly negative response to the ads, that was not the case with the study group. In fact, half of the viewers chose inspiration or happiness as the emotions they felt while viewing the ad. Respondents also felt the ads were generally effective with 46% saying they were “somewhat effective” and 21% saying they were extremely effective. Only 19% found the ads cofusing. MediaCurves allows you to watch the trending of interest throughout the commercial, which is particularly interesting. From this study, it appears the Palm ads are successful, but do these feelings of inspiration translate to actual purchase? Still too early to tell, but it appears the campaign featuring Tamara Hope is likely to continue given these strong numbers.